A child’s imagination is hugely important in their development into strong, healthy young adults. Currently, one of the most concerning aspects of raising children is the amount of time they spend in front of screens, whether it is TV, DVD, video, computer, PlayStation, etc. When a young child focuses their attention onto a screen, it is a very passive form of learning or entertainment. Instead of using their own imaginations to learn about the world and create something, children are passive recipients of visual and auditory stimulation that may or may not require some response using fine motor skills. However, this is a very artificial way of learning about the world and does not engage children in a kinaesthetic manner using their entire bodies. We give children a basis, a starting point to fulfil their potential. When they are wearing Port Authority’s Youth Silk Touch Polo they can be active both outdoors and indoors, doing everything a happy child as they express their imagination. The Port Authority’s Youth Silk Touch Polo carries a classic style which is popular all year round. It’s an impeccable item for any young boy or girl to make them look smart and trendy while being comfortable and happy. 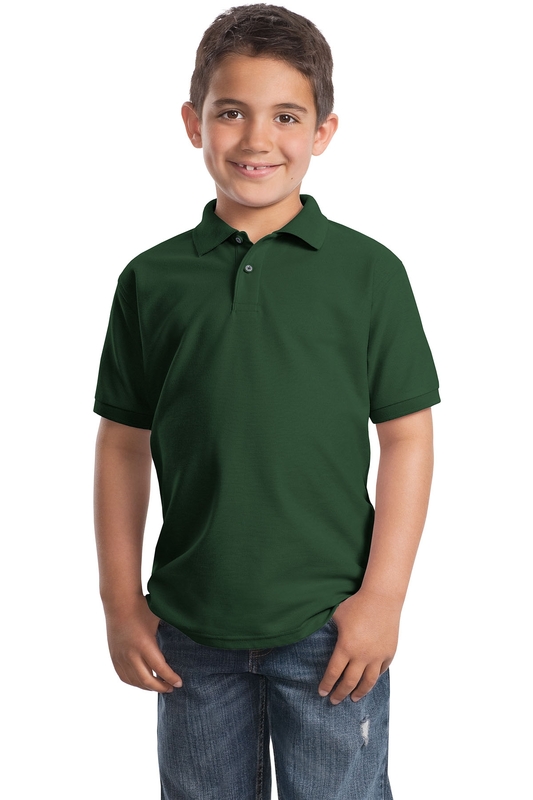 The Polo is most suitable for schools or kindergartens who want to make their children easily identifiable while representing the company in a honourable manner. It is also perfect for any summer camps or sports teams. It is easily customisable with brand logo. With dealing with different companies and brands a colour range is very important. That’s why we have an extensive range to choose from; Black, Burgundy, Cool Grey, Dark Green, Gold, Kelly Green, Light Blue, Light Pink, Lime, Navy, Purple, Red, Royal and White. The Polo weighs 5 ounces, and is made with a 65/35 polyester and cotton blend. The style includes a flat knife collar and cuffs, and two metal buttons with plastic edges that are dyed to match the thread colour. Other features of this style include double-needed armhole seams and hem, as well as side vents, making the Port Authority Polo a breathable pullover made for both indoor and outdoor wear. Youth sizes vary from; XS (4), S(6-8), M(10-12), L(14-16), XL(18-20). Inspire your children, utilise their imagination to express their individuality. Have a happy child wearing Port Authority’s Youth Silk Touch Polo.